Maples (Acer spp.) are popular landscape trees enjoyed for their foliage, growth habit and low maintenance requirements. Before a tree can begin to grow to its full potential, it must survive the period of establishment following transplant. Several factors influence tree health during this time. Proper watering is crucial for the fast establishment of a transplant. The appropriate amount of water to apply to a newly transplanted tree or shrub is five to seven gallons once per week. However, weather and soil type influence the amount and frequency of irrigation. Trees planted in well-drained sandy soils require more water than trees planted in a clay soil. If rainfall is adequate, the tree may require less irrigation. Thoroughly water the tree immediately after planting. The ideal watering method is to apply a slow trickle at the tree's base for several hours rather than a heavy, short soaking. Slow, thorough watering promotes deep root growth and strengthens the tree's resistance to environmental stresses. If there is uncertainty regarding whether or not to water the tree, dig down about 4 inches into the soil next to the tree. If the soil is wet at this depth, do not water the tree. If the soil is dry or only slightly damp, the tree requires watering. Another test involves pushing a metal rod into the soil ball. If the rod will only slide a few inches into the ball without excessive effort, the tree is not receiving adequate water. If the rod slides all the way through the root ball with minimal effort, the tree is being overwatered. Inadequate or improper watering can force a newly planted maple tree to show symptoms of stress. If the tree is not taking up adequate water, it will develop leaf scorch. The leaf margins or sections between veins show a browning or drying. Scorch appears when roots cannot absorb as much water as leaves lose through transpiration and may be the result of roots damaged or lost during the planting process rather than simple underwatering. Although scorch makes the maple more vulnerable to diseases and pests, it is rarely fatal and best addressed by deep waterings during windy, dry periods. Do not fertilize affected trees. Overwatering can be just as damaging to a new maple as underwatering. Like underwatering, overwatering can result in leaf scorch but it may cause leaf yellowing instead. Too much water around the roots can also induce iron chlorosis, another condition indicated by yellowing leaves. 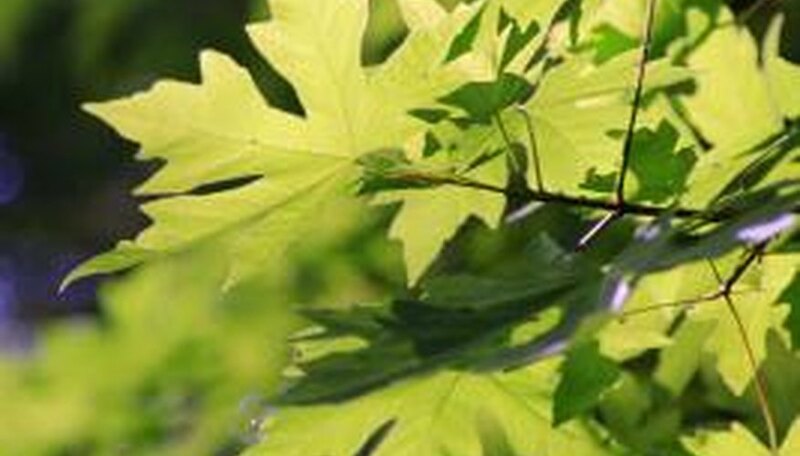 A number of additional factors may impact newly planted maple trees. Properly applied mulch helps to conserve soil moisture and control temperature and weeds, but there should be a mulch-free area for several inches around the trunk. Young trees typically do not require fertilization and fertilizer can actually damage roots. Prune off broken or infested branches, and you can prune branches in the canopy to balance the canopy and root system sizes. If the tree is tall or planted in a sandy site, it may require staking. A final, important consideration is planting depth. The maple tree should be planted so that the root collar remains at the ground line.